Soccer-Ireland.com can offer you the chance to win two tickets for a wonderfully entertaining evening in the company of English World Cup winner Nobby Stiles. 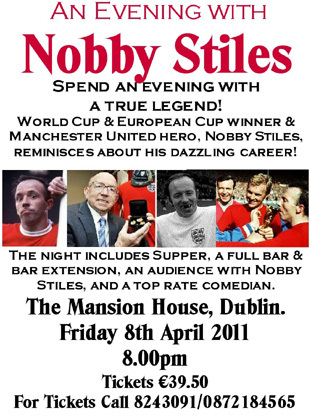 The legendary Manchester United fullback, and original hardman, Nobby Stiles has experienced a number of highlights throughout his glittering football career. He was part of the victorious 1966 World Cup Squad and he also lifted the European Cup in 1968 with his Manchester United team mates, including George Best and Bobby Charlton. One of the great characters of football, Nobby is an entertaining and funny speaker who is always in great demand. Tickets for this not-to-be-missed event cost just €39.50. Call 01 824 3091 or 087 218 4565 now to secure your place. What is the name of the former Irish international and Manchester United captain who went on to manage Spanish football giants Barcelona? The closing day for entries is 5pm on Friday 5 February 2011. The winning entry will be drawn from all of the correct entries on Monday 7 February 2011 and the winner will be notified by email. The winner's name will be posted on this page once the draw has been made. John Murphy from Kilnamanagh who is the Chairman of Kilnamanagh AFC and is a Manchester United fan.